Mountain Lodge at Snowshoe is the absolute perfect home to enjoy and experience the mountains. When you walk into this home you will immediately be greeted by luxury high-end finishes such as a rock fireplace, wood floors, timber ceilings, artisan light fixtures and much much more. The main level offers a fully equipped kitchen, dining room to seat eight, a breakfast type table to seat four more, and a bar that seats an additional two. The home offers 4 bedrooms and 4.5 bathrooms that are well acquainted to sleep 14 total. You can also find hiking trails that are located just two blocks from the house. Summer is not the only time to enjoy Mountain Lodge at Snowshoe, visit in the wintertime where you can watch the snow falling on the trees from any room. And as you are aware, skiing makes an excellent winter pastime! When you rent from River Ridge Rentals you are eligible to receive discounts on lift tickets, ski rentals, massages (they will come to you too! ), car rentals and more. Don’t wait any longer to call River Ridge Rentals and reserve Mountain Lodge at Snowshoe! This home was amazing!! It was absolutely perfect, had everything we needed for a great stay and very clean! The management staff were all so helpful and easy to work with!! This is 5 star cabin and would definitely recommend it to anyone wanting to visit Breckenridge!! 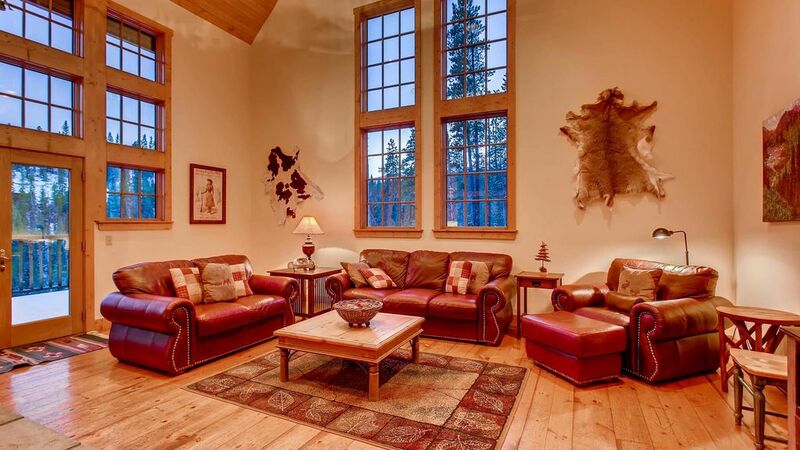 Only a few minutes from Downtown Breckenridge with stunning views of the mountains!! Very nice property. Close proximity to town. This was the perfect setting for our families to come together right after Christmas! The downstairs living area filled with games was perfect for the kids to hang out in allowing the adults to have our own space in the upstairs living area. The heated garage with two spaces was awesome on our cold stay! And there were sleds for the kids use! This house had everything we needed in the kitchen. And River Rentals made check in and check out the easiest I've ever experienced. In the winter, four wheel drive is a must. One group in our party didn't have it and they just stayed parked at the top of the driveway. It was not a long drive at all to get to the ski area and each night when we came home we were always going to opposite direction of the mass traffic so we were always able to zip right home. Plus the grocery store was right on the way back to the cabin, so convenient! Would highly recommend this property! We have rented with River Ridge multiple times in the past and there is a reason we keep coming back. Every property is kept in beautiful shape and absolutely adds to a great vacation experience! We had a great time in this house! There were 3 families for a total of 10 people and we had more than enough room for everyone. We loved the location too - close to town but far enough away to feel like a real mountain cabin. And we saw 3 huge moose on our first morning walk! The management was very responsive as well. We had one issue with a shower knob that was fixed same day. Great time by all. Minimum night stays vary by season. One night stays are not permitted. Check-ins are not permitted on Christmas Eve or Christmas Day.